Once upon a time there was a mom and her four sons and a - gingerbread cookie cutter. That cookie cutter and her gingerbread recipe were used at least once every year by mom at Christmas time to the delight of her four sons. Her sons loved to help her decorate each gingerbread boy and then, of course, eat them. Those cookies and that particular gingerbread cookie cutter became a famous cookie cutter (at least for many Americans). Making the gingerbread boy cookies continued for a number of years in mom’s kitchen, and each year the four boys always looked forward to “helping” by using the gingerbread cookie cutter on the gingerbread and decorating the gingerbread boys with homemade frosting. Of course they continued to eat them, rationed out one at a time by mom. Then, as all the sons began reaching junior high and senior high age, the tradition became something they no longer felt “appropriate” - that is – until they were full-grown, married and had families. Then, the tradition was resurrected and passed on in their families. In fact, the tradition was “expanded.” Now their families made the gingerbread boy cookies and added the tradition of watching classic Christmas time movies (“It’s A Wonderful Life,” Miracle on 34th Street,” “White Christmas,” “Christmas in Connecticut,” and “Holiday Inn” ) while feasting on the gingerbread cookies pressed by an exact duplicate of the original gingerbread cookie cutter used by mom. You see, a number of years previously, the oldest son requested he be given the gingerbread boy cookie cutter mom had always used. Mom said “yes,” but both immediately discovered that the plastic cookie cutter had been broken at some point in time. This saddened the entire family. Guy, the oldest son and an excellent researcher, became determined to find a cookie cutter exactly as he, mom and his three brothers remembered. Researching for some time, anticipating that he might only discover it accidentally in an antique shop - low and behold - he found it online and still available through a small company in New Jersey! Guy, my husband’s older brother, tried to track the gingerbread boy cookie cutter through its U.S. Patent number. No luck. But then, he found them on the internet, still available through The Cookie Craft Company. A small miracle, but significant to him and his extended family. 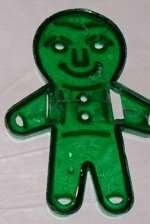 This vintage “Jolly Gingerbread Boy,” originally made in clear red, blue, and green plastic, was patented in 1940 by Fred and Mollie Miller of Enid, Oklahoma (patent No.127026). This gingerbread cookie cutter was the only design they ever made and patented and the patent was sold in 1961 to Educational Products which is “Cookie Craft” today. 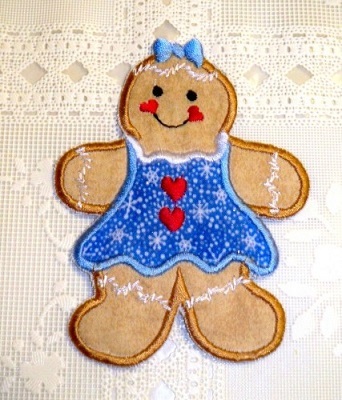 There are a wide variety of gingerbread cookie recipes available, but two are especially important for Guy, his brothers and the greater family. One is the original recipe used by mom. Guy describes the cookies as “good for dunking.” He says a large part of the taste comes from frosting the gingerbread men generously. 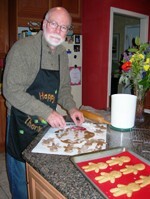 The other gingerbread recipe is from his wonderful wife, Anne. Guy believes that Anne’s gingerbread actually tastes better than his mom’s recipe (of he is a smart fellow), but he says it does “puff up” and in doing so, obscures the gingerbread boy cookie cutter imprint. But both serve the purpose of creating (or re-creating) a special cookie for a special holiday treat. Try them both! You and your family decide which recipe you prefer, and in doing so, create your own Christmas tradition! You might also consider enjoying your cookies while watching one of those classic Christmas movies Guy and his family watch every year as part of their Christmas tradition. Enjoy your gingerbread cookie cutter and gingerbread boy cookies and the company of those you share them with!